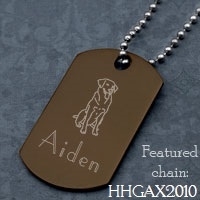 This Chocolate Brown Plated Dog Tag Pendant can be engraved on front and back with a symbol or message. Engraving will appear in a silver color revealing stainless underneath. DO you need a necklaces to fit this product? Necklaces are available for purchase separately.